Considered by many to be the best all-around size NRS raft, the 14′ Outlaw 140 gives you the load capacity for multiday trips for 2-3 people, room for fishing, and stability for big water paddling. And the price is unbeatable. 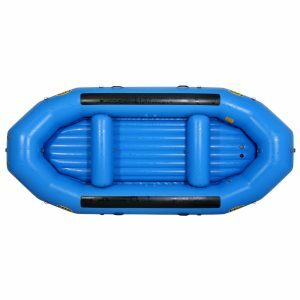 NRS Outlaw Series Rafts give you time-tested NRS boat designs at a price that will make you smile. 21″ tubes and a 7′ 2″ width give the 14′ Outlaw 140 great carrying capacity and big water stability while still being small enough for rocky technical waters. Super heavy-duty tube and floor material shrug off hard boating abuse. A 4″ thick drop-stitch floor insert inflates to a rigid 8-10 psi, giving the boat a stiffer wave-punching ride while providing a stable platform for standing in the boat. To get the rigid structure in the floor for best performance you will need a high-pressure pump. With the optional third thwart 8-9 paddlers can have a blast running rivers. Frame wear patches on top of the tubes and extra material on the bottoms of the side tubes protect against abrasion and wear. 12 stainless steel 2″ D-rings give plenty of tie-down points for frame and gear. Four comfortable EasyCarry™ handles make carrying it to the water a breeze. Three main-tube air chambers keep you afloat in the event of an accident. Self-bailing floor with quick-draining holes lets you leave the bucket at home. Trouble-free Leafield™ C7 Valves ensure easy inflation/deflation of the tubes, thwarts and floor.